Savory coastal cuisine with striking views of the sea makes for long lunches and romantic evenings above the quaint Del Mar Village. 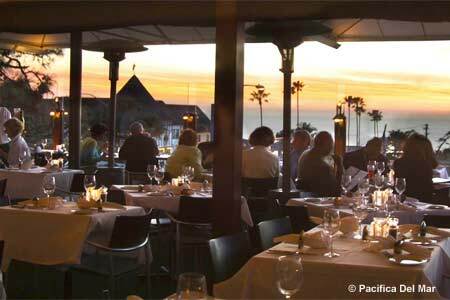 : A perennial favorite on the Del Mar scene, Pacifica offers coastal views, al fresco dining, people-watching and California cuisine. The modern interior is breezy fresh --- we like the wall-size wine bank, open kitchen and raw bar. Highlights from the menu have included roasted heirloom beets with burrata mozzarella and olive pesto duck two ways, and cast iron barramundi with shrimp andouille and grits. This is a good place for budding epicureans, too, with a kid’s menu that boasts a petite filet mignon, grilled salmon and tiger shrimp with honey dipping sauce. Those with a serious sweet tooth should steer towards the mocha semifreddo with white chocolate-espresso mousse and homemade toffee crunch. Don’t miss the happy hour at the famous serpentine bar. Pacifica boasts over 75 vodkas from around the globe, so its international vodka bar remains unrivaled in town.